Charleston is a treat for the senses. The delicate aroma of Carolina Jessamine dances amid the sea breezes; church bells resonate with the hum of the city. The details of this architecturally rich city reveal themselves when the peninsula’s sidewalks and seawalls are explored on foot. Innately walkable, the east-west grid of streets stretches from shore to shore. 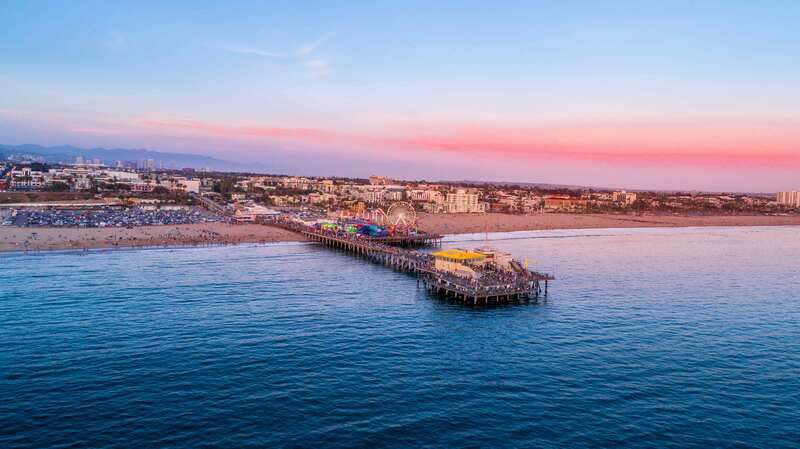 Bookended by two rivers – which, it is said, converge to form the Atlantic Ocean – the downtown peninsula is hemmed in by water and sky. 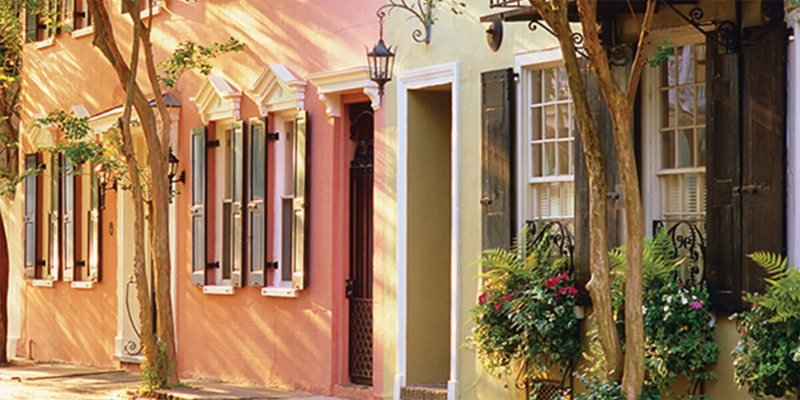 Take home a piece of Charleston by visiting the city’s unique shops. Start with Croghan’s Jewel Box: a treasure-trove of heirloom silver, estate jewellery and classic gifts. Sisters Mariana Croghan Hay and Rhett Croghan Outten are the third-generation owners of this gleaming boutique, which has been in business for more than 100 years. Treat yourself to a one-of-a-kind silver Celebration Cup – a treasured rite of passage for native Charlestonians – or a silver, long-spindled Rice Spoon; they’ve adorned Lowcountry tables since the plantation age, after all. 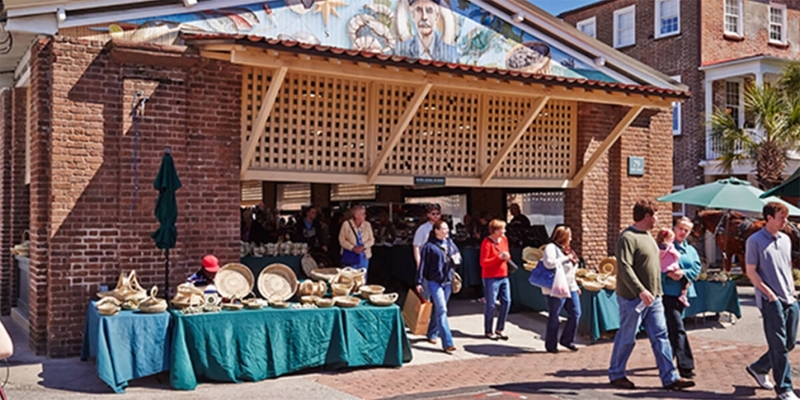 Alternatively, head to the Charleston City Market, one of the nation’s oldest public markets. Erected in 1804, with four vast historic buildings, the market sparkles from a recent renovation. One building has been transformed into a corridor of locally owned micro-boutiques, dubbed the ‘Great Hall’. 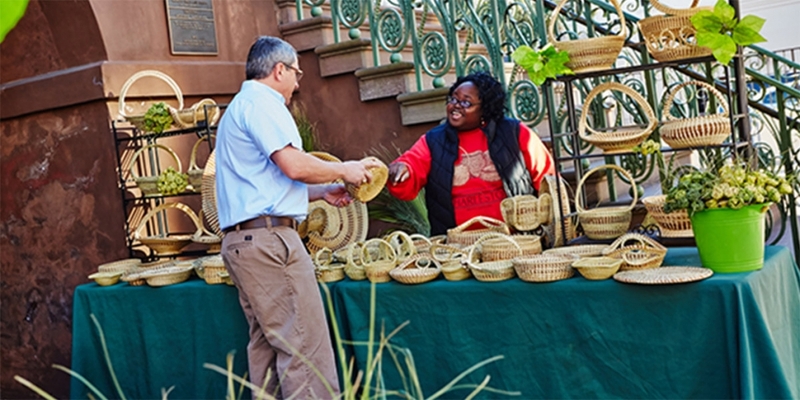 Charleston City Market champions 285 local vendors in total, including 56 artisans who weave sweetgrass baskets, one of the region’s prized indigenous Gullah crafts. Gullah is an African-American subculture that originated during times of slavery; unique to the Lowcountry, it still thrives today. Gullah culture is the basis for many of the area’s traditions, including intricate ironwork and Lowcountry cuisine. Learn all about it on a tour with local Gullah expert Alphonso Brown. 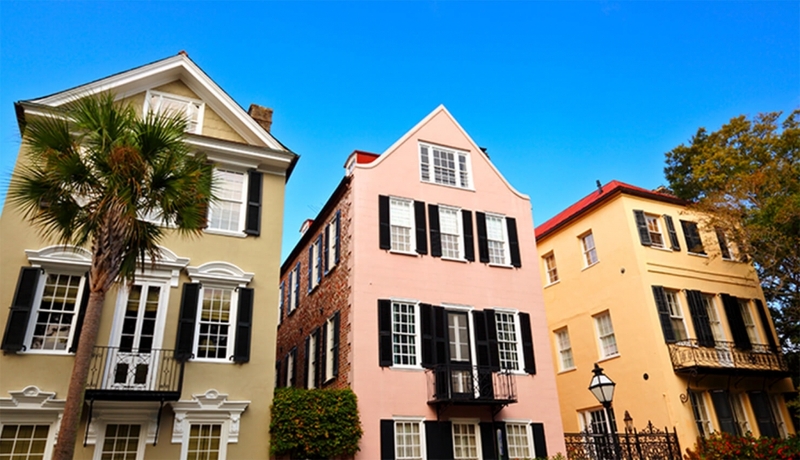 A short stroll from the famous harbour, mansions and attractions, you’ll find the Charming Inns of Charleston: boutique hotels, inns and bed and breakfasts conveniently located in the heart of the Historic District, surrounded by interesting shops. 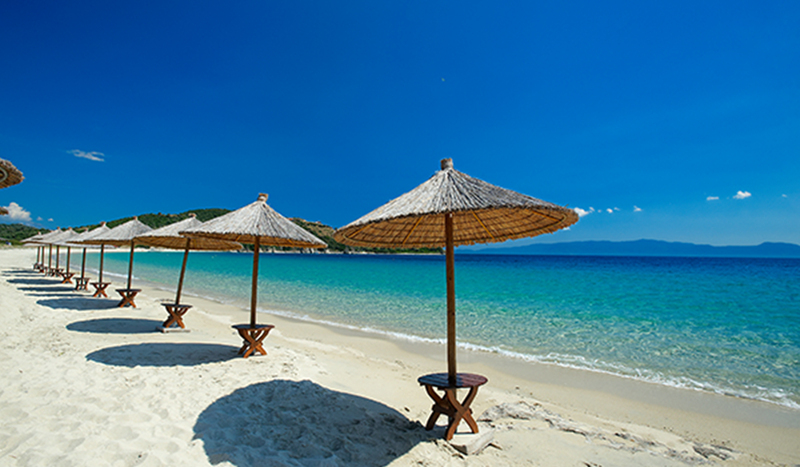 Elegant restaurants offering an array of delicious dishes are just steps from the hotels’ front doors. Each inn is distinctively different in architecture and style, but they share a sense of gracious hospitality. Popular inns include: John Rutledge House Inn, Kings Courtyard Inn, Fulton Lane Inn, Wentworth Mansion and Circa 1886 Restaurant. When it comes to boutique hotels, visitors can choose from the Dewberry or the Spectator Hotel. 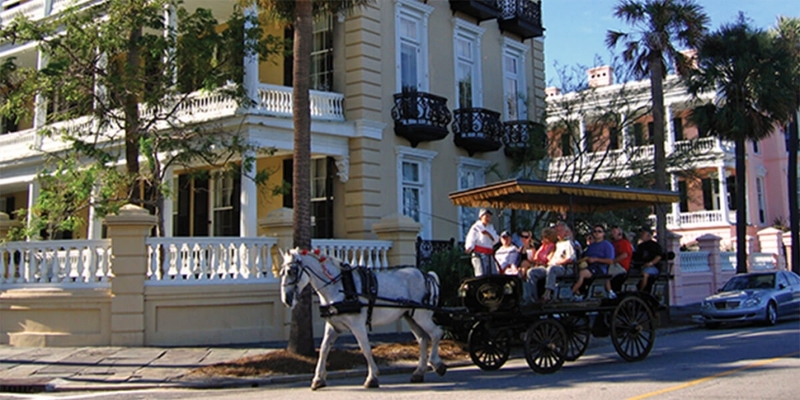 For an only-in-Charleston experience, join a horse-drawn carriage tour of the Historic District with Palmetto Carriage Works; you’ll visit the heritage-rich Museum Homes and discover Charleston’s past. A licensed guide will share entertaining stories and local lore over the course of your one-hour tour, which will start at the Big Red Barn, a block from the City Market.